Two thousand years ago, the Jewish religious scene was comprised of two major factions, the Sadducees and Pharisees. Although their respective theologies about God were quite different, these two camps did coexist—albeit not harmoniously—within the same religion. The reason for their different perspectives of the same God, likely comes from how they treated the Bible. The short version is that the Sadducees took away from the Bible, considering only the Law of Moses (the first five book of the Bible) as their holy canon. This gave them a partial and incomplete view of God. The Pharisees did the opposite. They greatly added to the Bible, introducing thousands of their own laws and rules. Although their intension in doing so was to aid them in holy living, their legalistic additions where elevated in importance to the point of surpassing the Bible as their guide. 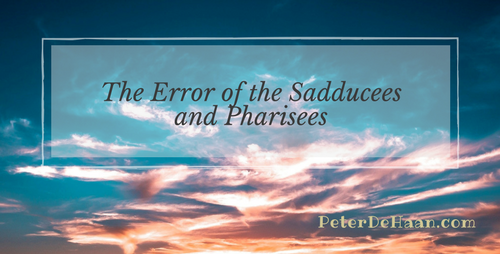 The error of the Sadducees was to take away from the Bible, while the error of the Pharisees was to add to it. Both are errors that we need to carefully avoid.